Square glass bottles can be intimating to work with when it comes to bottle cutting. It’s tricky to make a cutting score line around corners. A while ago I received the Premium Creator’s bottle cutter and I was a little unclear if this tool was capable of it. 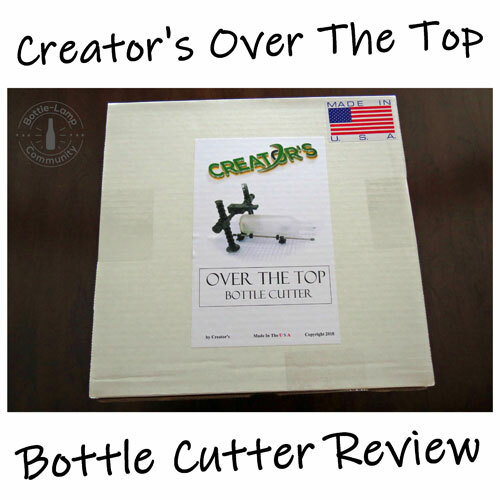 Of course I had to put the cutter to the test after my initial review for the Over The Top Bottle Cutter (OTTBC) got an immediate response. My first thought on how to cut the square bottle was to lay it down and rotate it around like a regular round bottle. Of course that wasn’t an option! When the scoring wheels got to the corners of the bottle it would move the wheel out at an angle. The end result would leave me with anything but a straight score line for the bottle separation process. Watch our How To Cut A Glass Bottle Neck video on YouTube to learn more about the separation process. The original Creator’s bottle cutter works with square bottles by having them stand on end. This makes sense because the flat surface on the bottom of the bottle allows for an even score line. Here’s the beauty of the Over The Top Bottle Cutter – you can literally take the bottle cutter apart and put it together any way that best suits your bottle craft project. 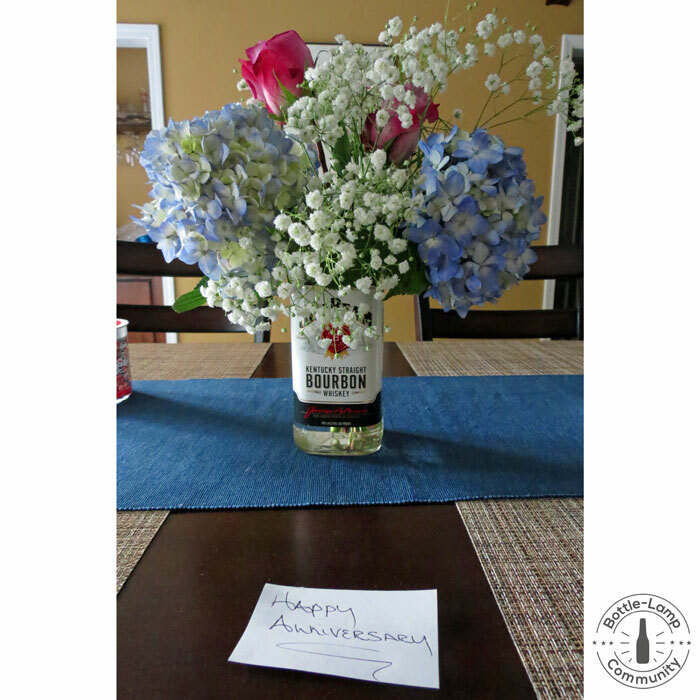 You can accommodate bottles in any shape! For this DIY project I removed the rollers from the device and simply worked with the goal posts and the scoring head. Once I had the wheel in line with where I wanted to score the bottle, I was ready to go. I now had everything set up but I was a little apprehensive about actually doing the score line on the bottle. Holding the scoring wheel head in the same, steady position, while rotating the bottle with my other hand, seemed like a tricky task. I wish there was a way to secure the head of the bottle with a tightening bolt, then this whole process would have been a breeze. After enough procrastination I simply went ahead and did it. As you can see in the video, the honey comb surface of this premium bottle cutter allowed the bottle to rotate the bottle with ease. I really didn’t need to put a lot of pressure on the bottle to get the wheel to make the score. With my left arm resting on my knee to keep a steady hold on the cutter, while my right hand rotated the bottle, I was done in no time at all. The score line was consistent and I actually got the two ends to meet. A perfect score! I had a few shards on the lip of the glass bottle. This needed some sanding with my Saber Tooth Diamond Sanding Kit. I’m happy that over 80% of the cut surface was perfectly done. 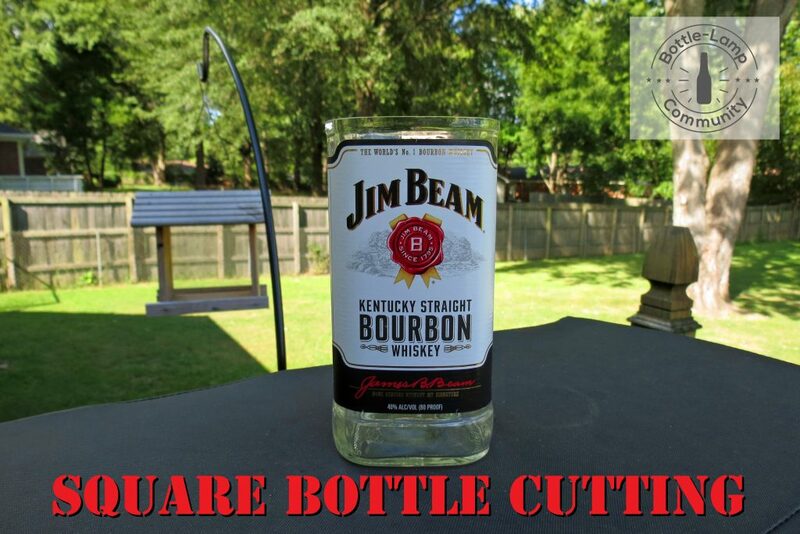 This cut square Jim Beam bottle was something I could actually work with and I definitely count it as a successful DIY project. In conclusion, can the Over The Top Bottle Cutter cut square bottles? Answer: Yes and it does a pretty good job at it. We would like to thank Greg K. for his question and inspiring us to create this post. Do you have any suggestions, questions or comments? Please leave us a comment below. This is so cool you did this video.